Bottom Line: A fantastically complex, pure, and flavorful aged rum with intricately meshed flavors and a long, warming, satisfying finish. 94 • The Real McCoy Limited Edition Virgin Oak 10 Year Aged Rum 46% (Barbados) $59.99. 93 • The Real McCoy 5 Year Aged Dark Rum 40% (Barbados) $29.99. 94 • The Real McCoy 12 Year Aged Rum 40% (Barbados) $49.99. 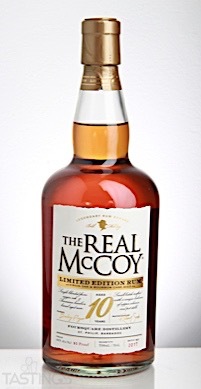 95 • The Real McCoy Limited Edition 14 Year Aged Rum 46% (Barbados) $69.99. 93 • The Real McCoy 3 Year Aged White Rum 40% (Barbados) $19.99. The Real McCoy Limited Edition Virgin Oak 10 Year Aged Rum rating was calculated by tastings.com to be 94 points out of 100 on 2/9/2018. Please note that MSRP may have changed since the date of our review.